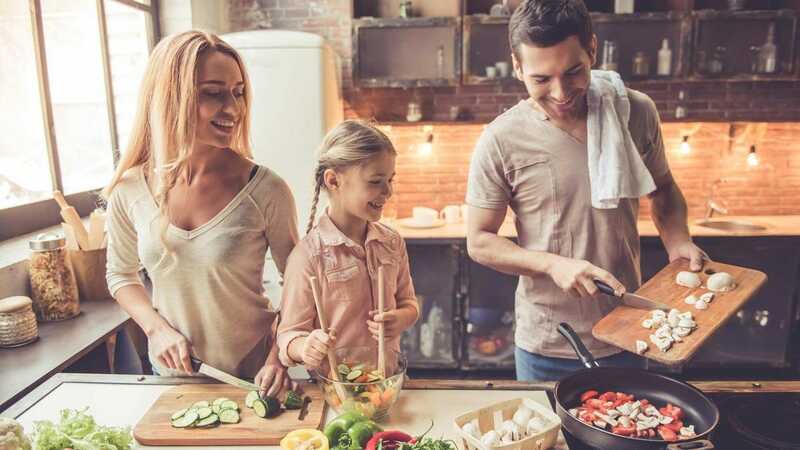 Whether you’ve just moved out on your own for the first time or you’re finally getting serious about cooking, we’ve rounded up a handy starter kit to help you stock your kitchen and prepare some tasty meals. The ideal kitchen setup can take a long time to assemble. That’s why everyone who has been cooking for a while seems to have an endless supply of utensils and cookware. Obviously, you don’t want to buy a grandmother’s kitchen worth of tools in one go, so we’ve focused on the absolute essentials. Plus a couple of neat extras that should keep you happy if your budget (or enthusiasm) extends that far. In each case, we’ve focused on a solid mix of dependable and affordable. After all, if you’re new to cooking, you don’t want to spend a fortune, but you do want something that will last until you figure out what your next step is in the cooking journey. Here are our essential picks for stocking your kitchen. Cutting something with a cheap knife that can’t hold an edge is a horrible experience. It’s more effort for you and it makes a mess of whatever you’re cutting. It’s also more dangerous as you’re liable to press too hard to compensate for the dullness which just ups the chance that any mishap with the knife ends up a disaster. Buy the Victorinox Fibrox Pro Chef’s Knife, 8-Inch Chef’s FFP for an easier (and safer) time in the kitchen. 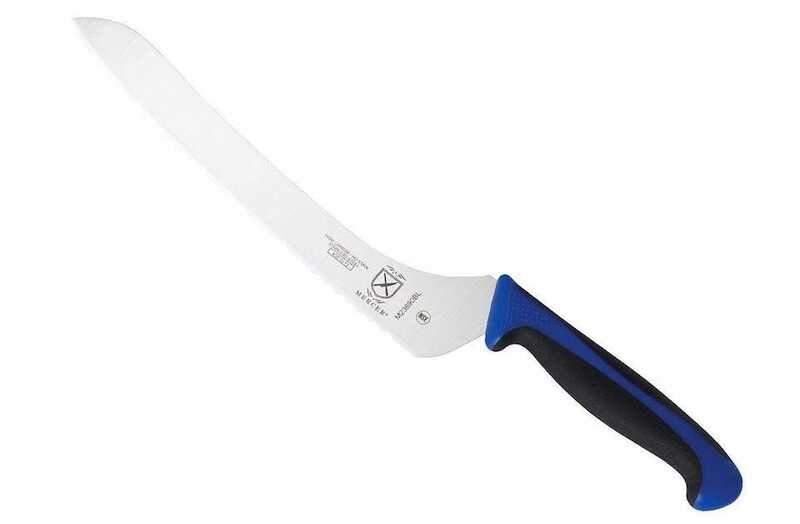 It’s a high-carbon stainless steel blade that provides maximum sharpness and edge retention. Practically, that means it’s going to cut better for longer between sharpenings. The handle is textured and slip resistant so it’s easy to hold too. Whether you’re slicing or dicing, this blade is going to feel good in your hand. It’s a great starting point. Eventually, you will own many different knives for many different purposes. 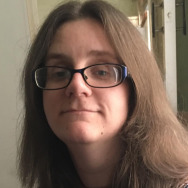 You’re just starting out though, right? Have a chef’s knife for the big chopping tasks and a serrated bread knife for cutting bread and you’ve got the two most basic kitchen tasks totally covered. While a good chef knife can perform 1,001 tasks in the kitchen, there’s no substitute for a serrated bread knife when it comes to cutting bread properly. The Mercer Culinary Millennia 10-Inch Wide Bread Knife is a fine choice. Made from one piece of high-carbon, stain free Japanese steel, it’s pretty tough. It’s also super sharp so it’ll slice through your bread without any hassle. Don’t worry about your fingers though, as there’s a protective finger guard along with a sturdy grip and slip resistance on the handle. It’s built for comfort as well as effectiveness. The worst thing you can do is cut food on your kitchen top or table. It’s likely to blunt your knife, make a difficult to clean up mess, and it’s not particularly sanitary. 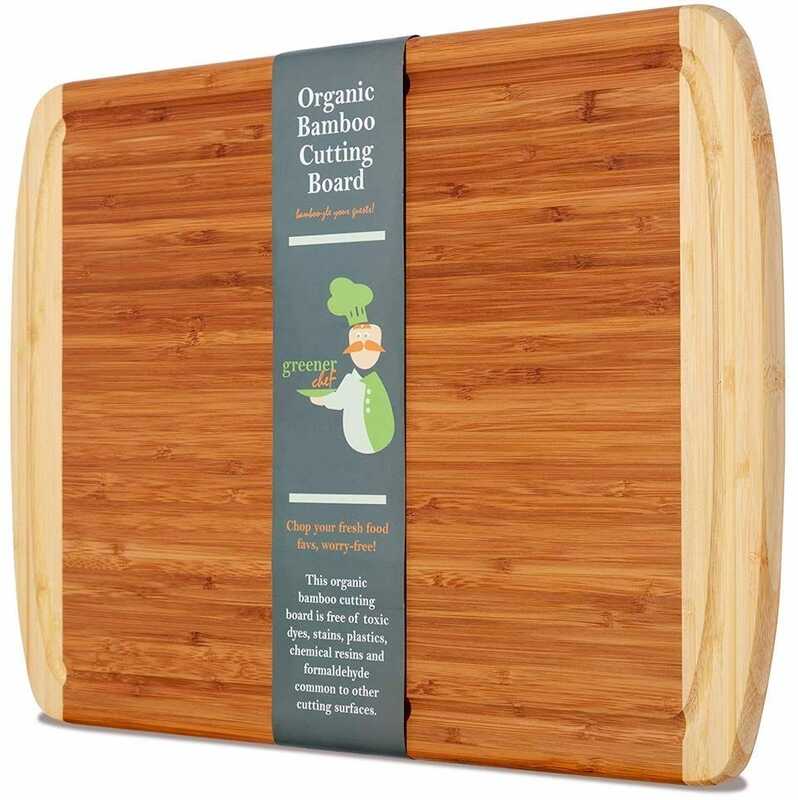 Instead, buy a good quality cutting board such as the Greener Chef Extra Large Organic Bamboo Cutting Board. It’s made from heavy duty bamboo with juice grooves around the edges for catching any liquid that falls from what you cut. By using it, you won’t blunt your chef’s knife, and it’s a far safer surface to use overall. The large size makes it great for small items as well as larger things like a substantial chunk of meat or a watermelon. It looks pretty attractive too. We could write thousands of words on good skillets, mostly because we already have. Check out our full guides to the best non-stick skillets, and cast iron skillets. If you just want to get straight to the point, buy the Lodge Cast Iron Skillet. It’s only $15 but it’s really good for the price. Pre-Seasoned, you won’t have to worry about preparing it before use (yes, that’s a thing for cast iron skillets). It has great even heat retention across the surface, along with a sturdy handle. It lacks a few finer details like a silicone handle for safety, but other than that, you can’t really fault the quality. It’s an essential for every kitchen. Ideally, you want to own many different saucepans. Believe me, the more you cook, the more you’ll find yourself wanting new saucepans, as you end up favoring certain saucepans for particular tasks. Still, just starting out means you should be good with one skillet and one saucepan. 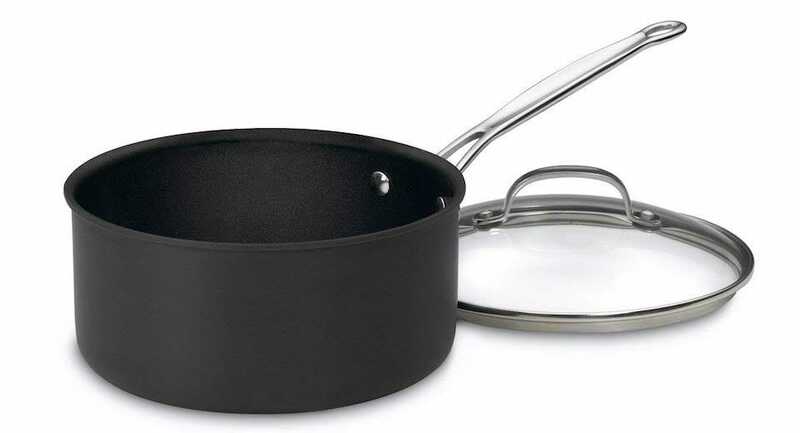 The Cuisinart 6193-20 Chef’s Classic Nonstick Hard-Anodized 3-Quart Saucepan with Lid is a great beginner’s saucepan. Because it’s a good size, you can use it for quick dishes or longer stewing sessions. There’s a glass lid so you can keep an eye on how your meal is progressing, plus the steel handle stays cool at all times. It’s ideal for one pot meals. Roasting a hunk of meat is one of the most satisfying parts of cooking, and it’s actually remarkably easy to do. You need a good roasting pan for ease of use, however. 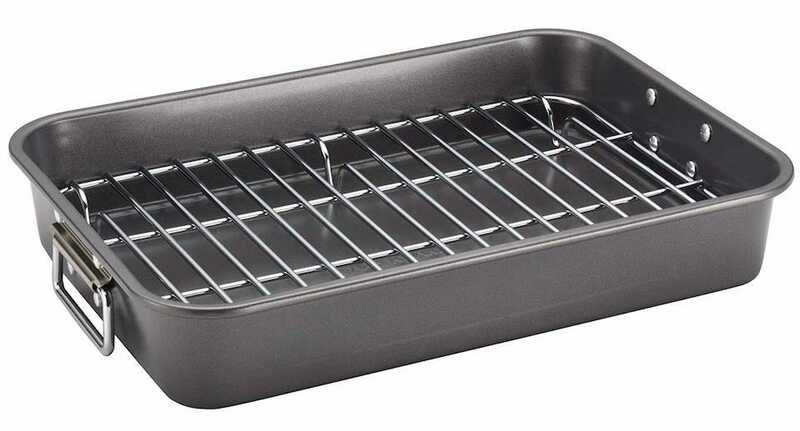 Buy the Farberware Nonstick Bakeware 11-Inch x 15-Inch Roaster with Flat Rack, and you’re set up for a while to come. It’s a good size for most cuts of meat or if you want to cook a 12lb turkey too. It’s that nice mix between small enough to store easily without having to worry about running out of room when you’re using it. There’s a sturdy rack to place the meat or bird on, with fat dripping off away from the cooked meat. Sturdy chrome plated handles ensure you don’t have to worry about losing your grip on the pan when you lift it out of the oven either. 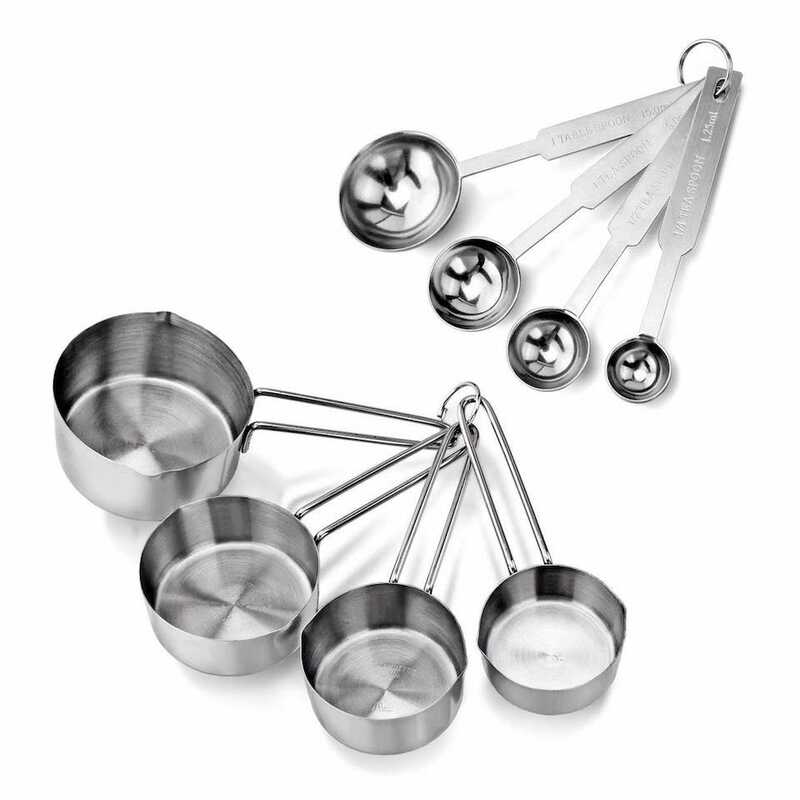 The set includes 4 different cups, encompassing measurements for 1 cup, 1/2 cup, 1/3 cup, and 1/4 cup. It also has measuring spoons for 1tbsp, 1tsp, 1/2tsp, and 1/4tsp. Between those two sets, you’re covered for the majority of recipe suggestions so you won’t have to worry about any more accurate measuring than this. It’s a real time saver. Because the set is all made from stainless steel, it’s really easy to wash up afterwards too. Once a lazy student, I would strain pasta or noodles by tipping the saucepan very carefully with the lid mostly on top so that I could drain the water away. This isn’t really advised because you end up with your dinner in the sink. 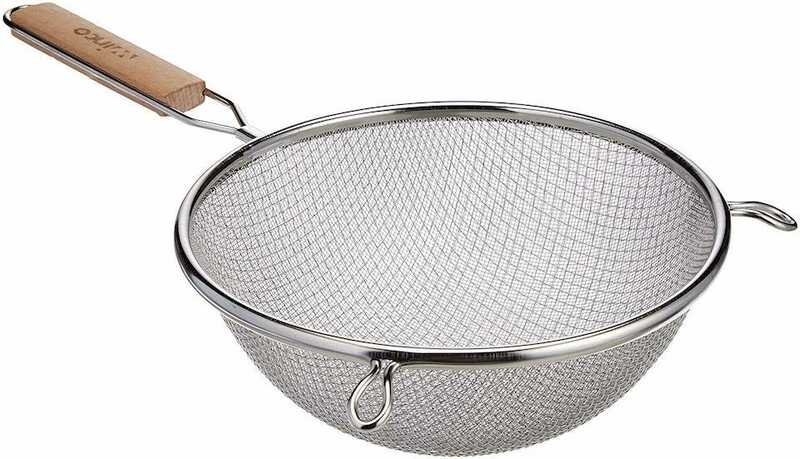 Instead, buy the Winco MS3A-8D Strainer with Double Fine Mesh. It’s cheap but effective. Made from stainless steel, it’s reasonably simple to keep clean, with a wooden handle to hold onto. It’s a simple design but that’s pretty much all you need. It makes sense to buy bigger as you can always strain small quantities in it but if you run out of space, well, you’re in a jam. In certain cases, you can whisk and mix with a spoon, but a dedicated whisk is so much easier to use. For $11, you can buy this Silicone Whisk Set and save yourself plenty of hassle. 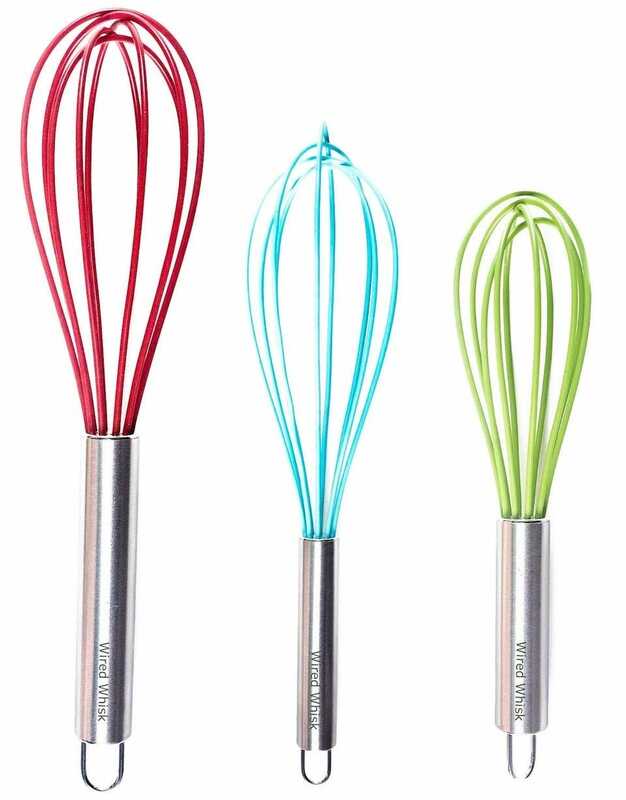 Each whisk is perfect for mixing, beating, or stirring. As each is made from silicone, they’re really easy to clean afterward too. They look fun as well. Sure, you can buy a dirt cheap can opener but the hassle of turning it will soon begin to annoy you. Especially when you have to open multiple cans quickly. 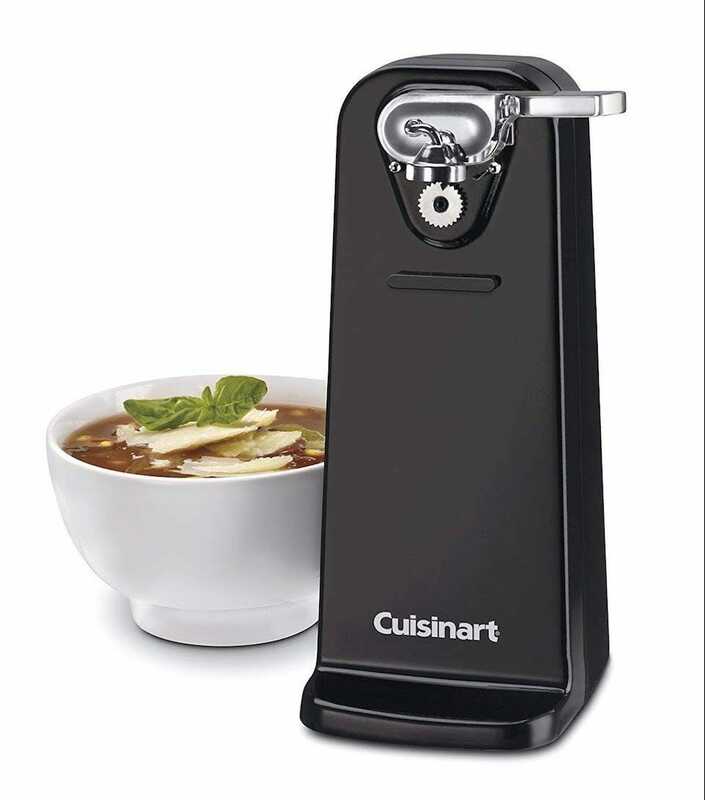 Buy the Cuisinart CCO-50BKN Deluxe Electric Can Opener and all that suffering fades away. It’s an electric can opener that sits on your kitchen side waiting for action. You operate it with a press and release lever with a magnetic lid holder holding the can in place for you. A few seconds into pressing the lever, and the can drops down safely open, with the lid staying up top. It’s safer and faster than a cheap manual can opener. Want to add some wine to your chilli or bolognese recipe? Awesome idea. It makes it taste so much richer. Better make sure it’s a screw top bottle unless you have the Ipow Stainless Steel Red Wine Beer Bottle Opener Wing Corkscrew though! 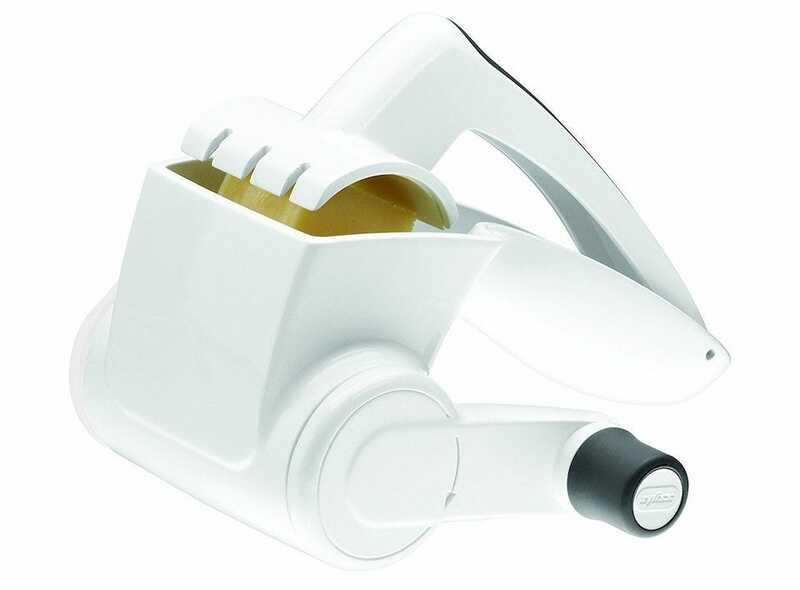 A straightforward enough corkscrew, it also has a built-in bottle opener for when you need to open a bottle of beer. 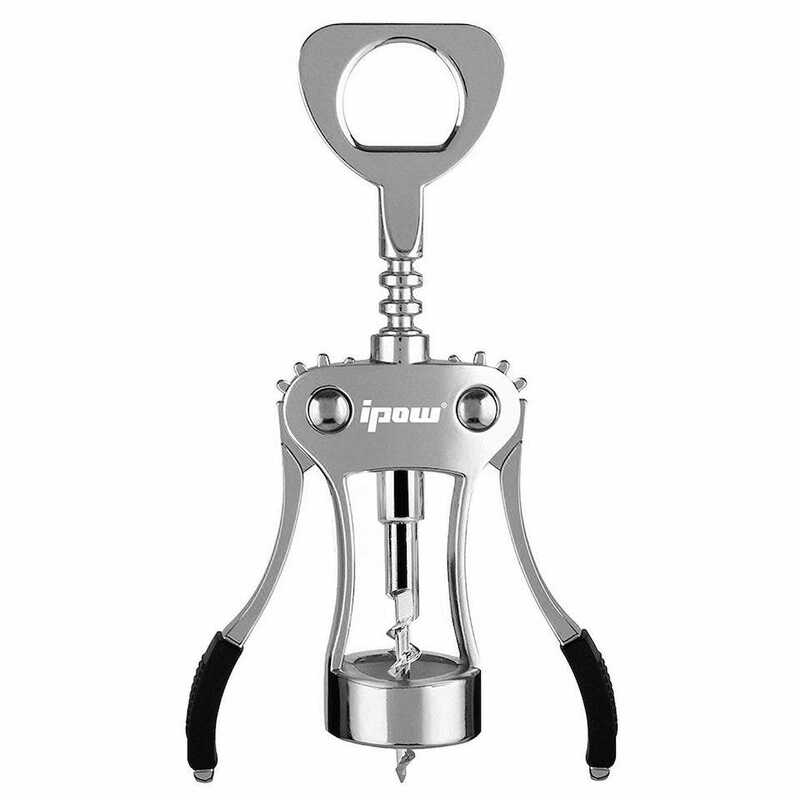 Everything about the corkscrew is pretty sturdy, thanks to its zinc alloy body and stainless steel corkscrew. It’s comfortable to hold too, so you can open a bottle quickly enough. It’d be nice to kit out your kitchen with tons of different equipment, we know. Budget considerations mean you probably don’t want to do this straight away but we have got a couple of suggestions of really convenient extras that won’t break the bank. If you plan to cook a lot of meat, it’s important you know that it’s reached the correct temperature. A dedicated meat thermometer is far better than relying on your oven’s temperature setting. The Habor Instant Read Cooking Thermometer is a good, inexpensive option. 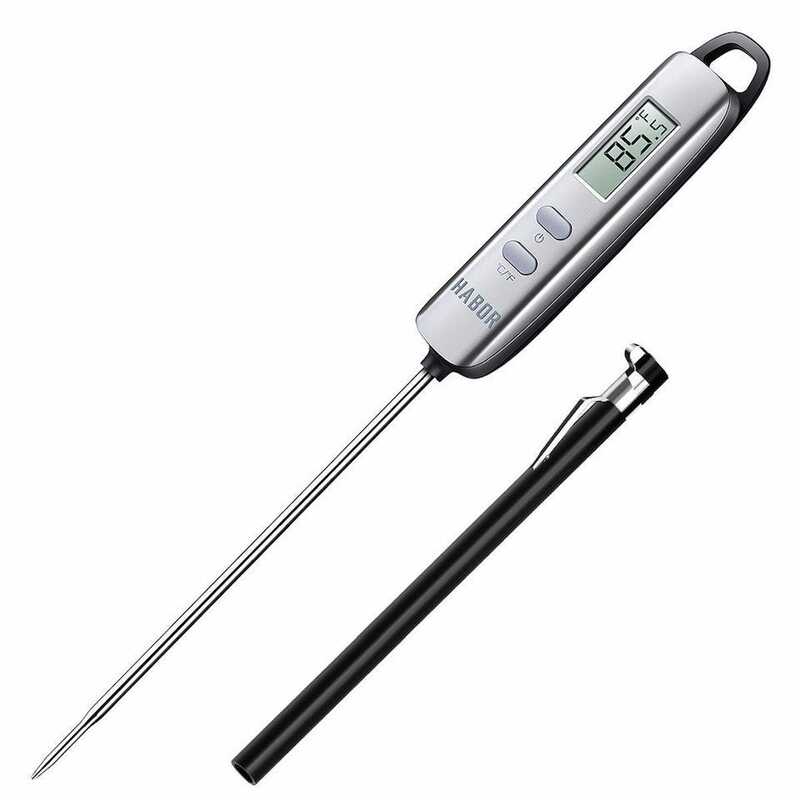 Simply pull the meat out of the oven, and poke it with this thermometer. You get the temperature within 4-6 seconds, so you know exactly what’s going on. A regular cheese grater is fine but a rotary one makes everything so much easier. Buy the ZYLISS Classic Rotary Cheese Grater and dread grating cheese a little less. All you have to do is cut a block of cheese and place it in the rotary grater then rotate the compartment. Uniform size cheese comes out quickly, without any need for you to keep using elbow grease to do the hard work. It’s a contraption that works well for other items too like chocolate or nuts. It’s a great effort saver. Your laptop might be the coolest ultraportable, detachable, convertible, whatchamacallit-able thing on the block. But that doesn’t mean a lot if its battery dies halfway through an email. These are the longest-lasting laptops on the market.